Over 400 gathered for the Fight for $15 march to the corner of Troost Avenue and Meyer Boulevard. The protesters who chose to sit in the street were arrested one by one. 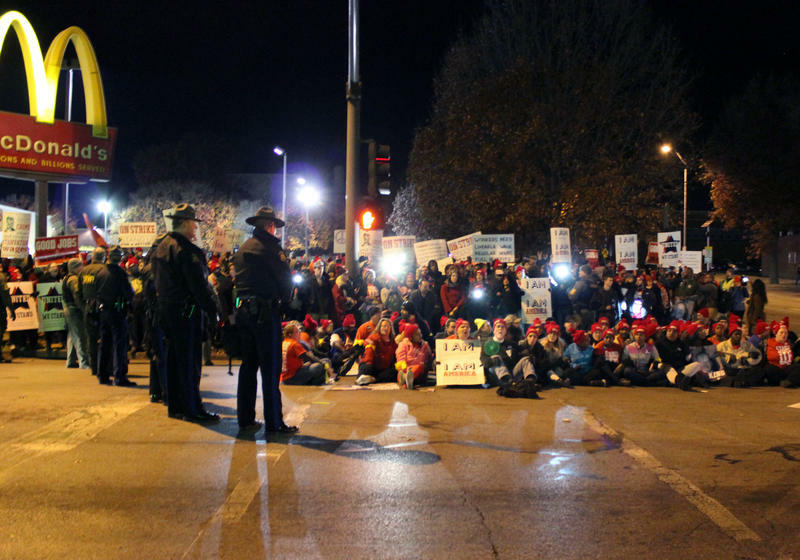 A rally at 63rd and Paseo kicked off the Fight for $15 demonstration Tuesday night. As protesters donned in red in connection with Stand Up KC gathered, cars driving by through rush hour traffic honked in support. 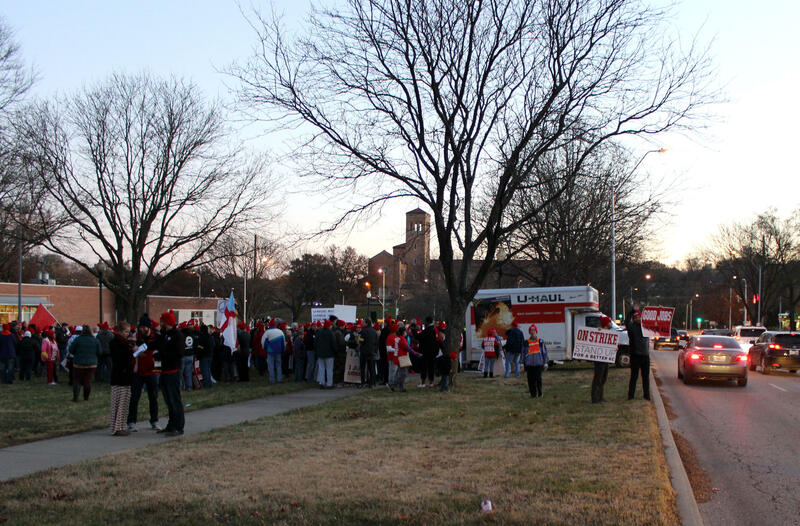 Across the Kansas City area, low-wage workers walked off their jobs starting at 6 a.m. Midday, University of Missouri-Kansas City students staged a walkout to join in solidarity with protesters. 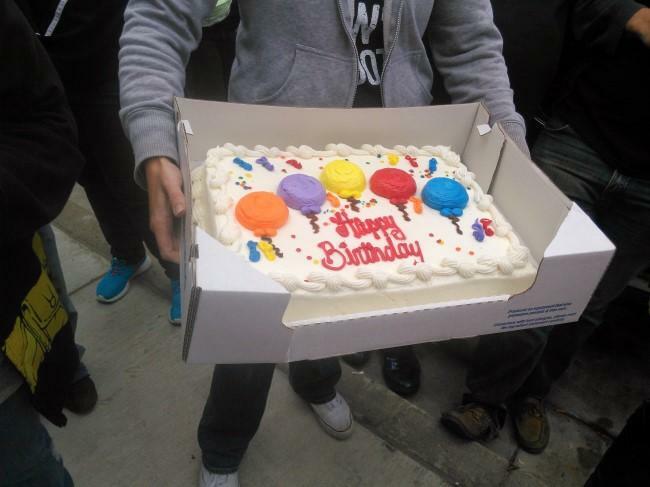 The final event began with a rally at 5 p.m., followed by a march to Troost Avenue and Meyer Boulevard at 6 p.m. When the crowd arrived, they were immediately met by the police -- seven officers on horseback, and nearly 40 by foot. Handfuls of protesters began sitting down in the street, causing the police to block off the streets for blocks. The crowd sang songs as arrests began. Police picked protesters up one by one, cuffing them with twist ties and escorting them to the opposite curb. Donna Birks was one of the last protesters sitting in the street awaiting arrest. "I'm sitting here for economic justice, and for people to start getting paid a proper wage, especially from these corporations that are making millions and billions in profit," Birks said. Birks is retired now, but he worked for General Motors for 40 years, and is a member of the United Auto Workers labor union. "I've never been to jail, so this is a new one for me. Sometimes you got to do what you got to do," Birks said. By the end of the demonstration at 7:20, around 100 people were arrested. Among those arrested were Burger King employee Bridget Hughes and McDonald's employee Richard Eiker, both of whom spoke at the evening rally. Head Start childcare worker Kimmy DeVries was arrested along with Reverend Susan McCann of Grace Episcopal Church. "I knew it would be a peaceful crowd," said Jackson County Sheriff Mike Sharp. "We do things differently here in Kansas City. We respect the community and the community respects us, and that's why this demonstration went the way it did." Many demonstrators held posters reading 'I Am America.' Protesters boasted a message of unity in diversity. 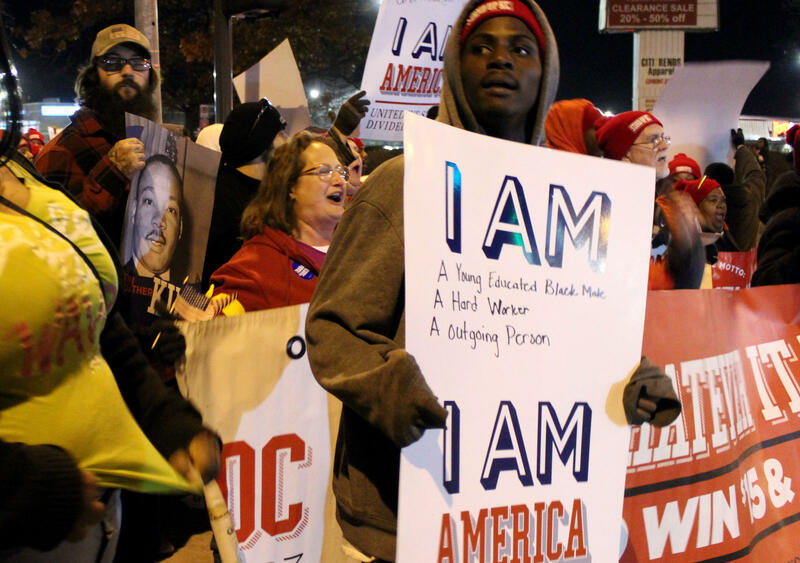 The prevailing message of the night from the demonstrators went beyond the call to raise the minimum wage. "We stand up against racism, homophobia, sexism," said Bridget Hughes, the Burger King worker and mother of four who was arrested. "We won't stand for attacks. Tonight, we show we are united." Andrea Tudhope is a freelance reporter and producer for KCUR 89.3. You can reach her at andreat@kcur.org. 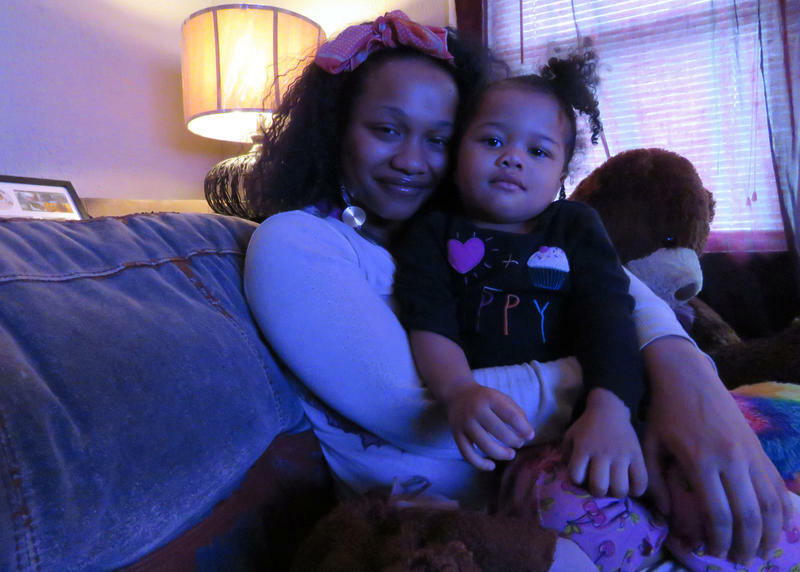 Last November, for the first time, Kansas City child care workers spoke out about their low wages, as they officially joined fast food and other low wage workers in the Fight for 15, a movement to raise the minimum wage to $15 per hour. A million-dollar housing project in Kansas City is being built to achieve two things: get homeless veterans permanent housing and restore blighted, abandoned properties in the urban core. Neighborhoods United, an area non-profit, is teaming up with the Kansas City, Missouri, branch of the NAACP and the Black Economic Union to restore empty properties in blighted neighborhoods and convert them into energy-efficient duplexes for veterans and people with disabilities. On Wednesday, Central Standard host Gina Kaufmann discussed a recent photography exhibit, I, Too, Am America. The photographers are part of the Langston Hughes Club, about 20 fast-food workers who, along with an organization called Stand Up KC, have been on strike for the last two years, pushing for an hourly wage of $15 and a union. Working with photojournalist Steve Herbert, they documented the world through their own eyes.